Hulusheng (Traditional Chinese 葫蘆笙, Simplifed Chinese 葫芦笙, which means "gourd sheng") is the Chinese name for one of the oldest versions of the Asian free reed mouth organ. Also called piaosheng (瓢笙, piao being another word for dried gourd), it is played by various ethnic groups in Southern China and neighbouring countries, including the Lahu, Lishu, Naxi, Yi and others and it is known by the local names of naw, nuo, ngail mo and ang. It has a dried gourd as a windchest, into which have been inserted several bamboo pipes (most often five of them) sealed into place with wax, each with a free reed mounted towards the base of the pipe. 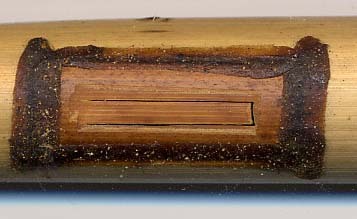 Traditionally these reeds were made from bamboo, but recently metal reeds have been used. The neck of the gourd serves as the mouthpiece. 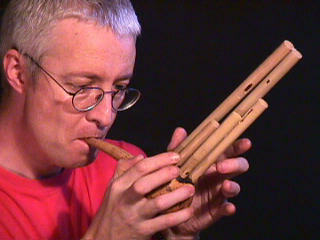 Like most Asian mouth organs, each pipe has a finger hole in the side, the reed only sounding when the hole is covered. However, unlike most Asian mouth organs, the pipes are open at both ends and the lower ends protrude through the base of the gourd. By covering the lower end of a pipe with the thumb, the resonant frequency of the pipe is changed, causing the note to be bent downwards in pitch. A similar method is used on the modern Claviola to bend notes and add vibrato. Some models have additional gourd resonators added to the top of certain pipes. The tuning scheme varies from region to region, but is generally pentatonic, although "improved" hulusheng have appeared with more pipes and a Westernised tuning system. A YouTube playlist devoted to the hulusheng.